Bed Rug or bed mat?? Discussion in '3rd Gen Tundras (2014+)' started by Ol' Salty Dawg, Dec 27, 2018. SouthBoundSteve and Grey Wolf like this. Between you and Mr. Matt, @Grey Wolf , Case closed!!!! NewImprovedRon and Grey Wolf like this. Yeah...but i think Ron thought the discussion was about bedbugs.....heh.heh..
Blueknights75, NewImprovedRon and SouthBoundSteve like this. Good to see you "out and about" this morning, Steve! Grey Wolf and SouthBoundSteve like this. Anybody taking bets on what avatar @SouthBoundSteve will be sporting after today's game? I'm thinking it might be orange and blue with a large "A" in it...….. I have a Bedrug and a Snugtop. Great set up. Comes in handy when I have the grandkids. I've been known to crawl in a take a nap a time or two during hunting season. Good for tailgating too. Bedrug was the first mod i got, then the tonneau cover. Figured doing yard work and moving furniture/gym equipment, easy on my knees than linex the bed. Ya'll ain't making this easy lol. But I think I will lean towards the bed rug. Thanks. Grey Wolf and NewImprovedRon like this. Mine was bought used. Like new about 3 years ago. I've had kids, dogs, rock, lumber, camping gear, Xmas trees, you name it. Still looks good. Fir needles can be a small pain to vacuum but I always get most of them. The rug cleans easily and the are some good videos on BedRug website and YouTube. There are ones that are like a hybrid, a mat and rug. that way you can have a rug, with padding, that dries out easily, but can still yank it out in a moment should you need to carry something dirty like logs or dirt. I put an OEM mat over top of my spray in liner. I was on the fence as the OP is but think for my use the OEM matt is best. Easier to keep clean IMO. BedRug they sale one without the tailgate part, this is the third one I’ve owned all have held up vary well Five yrs.being the longest, the one in my last truck after Four yrs. is now in my neighbors truck. Who has the best price on that bedrug? eccracer104 and Pigglet222 like this. sr5shark No matter where you go, there you are. I got my BedRug bed mat from Amazon in their Warehouse Deals section. It was like new (basically someone purchased and returned it) and was ~$50 less than new. With free shipping (and a free return if it was not as described) it was a good deal. jtwags and 040Tundra like this. You might want to check with @eccracer104 , Mike, to see what king of pricing discount you can get from Autoanything.com. Marty McFly, eccracer104 and NewImprovedRon like this. Marty McFly and Grey Wolf like this. I would think it depends on how you use your truck. I don't have experience with Bed Rugs, but I just can't imagine they would hold up well or be very convenient for a lot of my uses. Maybe I'm wrong though. I have a spray-in liner and a Dee Zee bed mat. Like the combo a lot so far, though admittedly I haven't hauled anything too serious in the bed of this truck yet. I wanted the spray-in liner for rust and general protection, and the bed mat for extra dent protection on the floor of the bed and to keep things from sliding around. Sometimes it's nice to be able to slide things into the bed, so the non-slip surface is a trade-off, but one I'm very much liking. In my last Tacoma with the polymer bed, I didn't bother with any protection in the bed. A couple times I put a big heavy digging bar back there and didn't tie it in because I wasn't used to needing to. When hitting the brake even lightly I was worried it was going to punch right through the bed it would slide so hard. This mat is the opposite of that. Yesterday I tossed some splitting axes, heavy steel wedges and some logging chain in the bed toward the back. That stuff never budged on the trip. I'm really impressed with the Dee Zee mat. Way thicker than I expected it to be, I like it a lot. I'm actually pleasantly surprised by how much I like the carpet. It's not real carpet, it's more like astroturf. It's recycled plastics that look and feel like carpet, and underneath is a closed cell foam so it doesn't take on any water. It's grooved to match the bed so you now have a flat surface, padded to protect the bed and items you toss back there, does a decent job at holding things in place too. Not near as much as a rubber bed mat but on the upside you can slide things on it more easily. 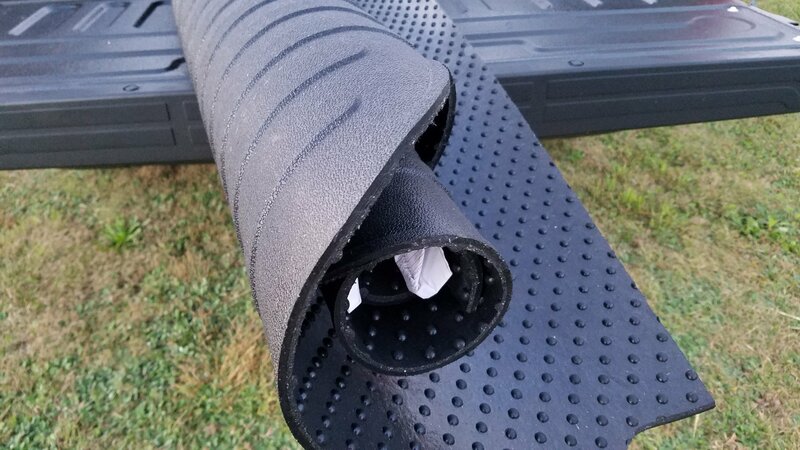 There's a flap that connects the bed section to the tailgate, so like the week prior when my friend borrowed my truck for a load of gravel hundreds of little rocks don't get stuck between the tailgate and the bed. I haven't had it long enough to really tell on the durability or just how easy it is to clean, but I'm very happy with it so far. This particular model is the Husky Liners Ultrafiber bed liner. Husky is under the Truck Hero umbrella which also houses BedRug, and if you took the labels off each I doubt you'd be able to find a difference between the two. Marty McFly, equin and Grey Wolf like this. Wait, you loaned a friend your truck to haul gravel? Now you, sir, are a true friend! eccracer104 and Grey Wolf like this. NewImprovedRon, Grey Wolf, Marty McFly and 1 other person like this. Another vote for the bedrug, especially with a shell. Just a great all around option - comfortable yet durable. Ol' Salty Dawg [OP], equin, NewImprovedRon and 2 others like this. I vote bedrug. It offers great protection and if you have to crawl in your bed it’s easy on the knees. Cemented, equin, NewImprovedRon and 2 others like this. 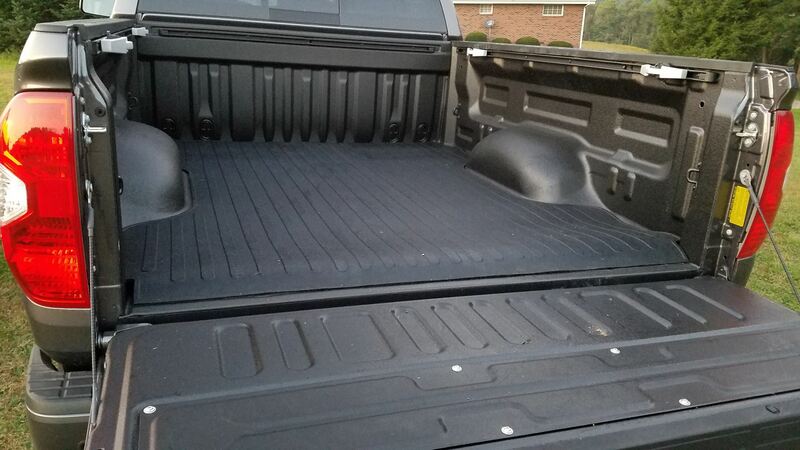 Entire Site Forum: 3rd Gen Tundras (2014+) Thread: Bed Rug or bed mat? ?